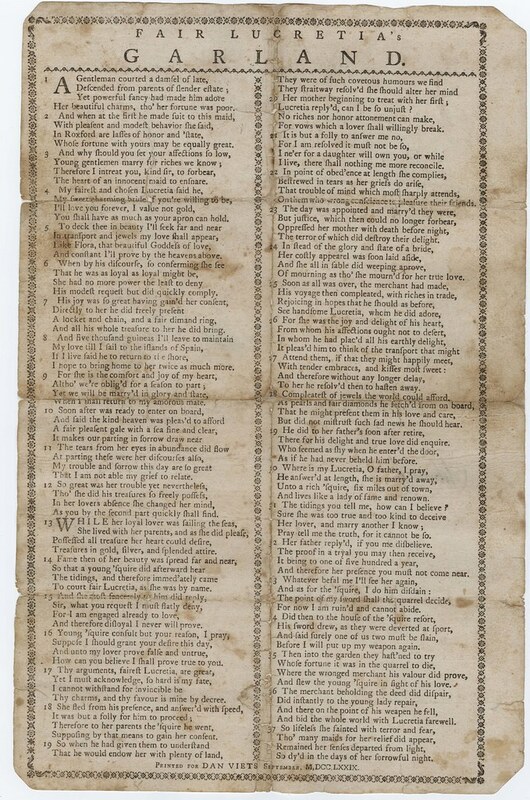 The Yale Collection of American Literature has acquired an apparently unrecorded 18th Century American verse broadside: “Fair Lucretia’s Garland,” [New Haven? ]: Printed for Dan Viets, September,  (Description: 1 sheet ( p.) ; 36 x 24 cm). The poem recounts the tragic tale of a young merchant who falls in love with Lucretia, becomes engaged to her, then sails away to make his fortune. The text is surrounded by printer’s ornaments of four-petaled flowers, suns, and rosettes (see E. Reilly, A Dictionary of Colonial American Printers’ Ornaments & Illustrations #’s 492, 510, and 745). The first two printers’ ornaments were used by Samuel and Thomas Green who were printing in partnership in New Haven, 1769-1797. Dan Viets was born on 2 July 1751 at Newgate, Simsbury, Connecticut. He was the son of Captain John Viets and Lois Phelps. Captain Viets was the first keeper of Newgate prison which received its first prisoner December 22, 1773. Dan Viets’s brother was the Reverend Roget Viets, a Yale graduate, who during the Revolution was fined and imprisoned for supporting Loyalists. A unique copy of a 1795, Danbury, Connecticut, 12-page pamphlet exists at the Huntington Library with the title Fair Lucretia: being a sorrowful history of a rich merchant, and the daughter of a farmer in England. Occasioned by a squire’s love for her, and her parents desire for riches. The American Antiquarian Society holds several versions of the poem, including a unique copy published in Hudson, New York in 1797. The Yale Collection of American Literature has acquired an important archive of correspondence by and about early twentieth century American writers. The archive, gathered by Eugene L. Delafield (1907-2001) , a New York book collector, centers on poets and editors, chiefly William Rose Benet and his sister Laura, Alfred Kreymborg, and Leonora Speyer. Included are letters from Conrad Aiken, Maxwell Bodenheim, Marianne Moore. A record of the collection is available online: Delafield Correspondence Collection. Related materials in the Yale Collection of American Literature include the Benet Family Correspondence Collection, Benet Family Manuscript Collection, the William Rose Benet Papers, the Dial/Scofield Thayer Papers, and the Wescott-Wheeler Collection of Marianne Moore. Additional related materials in the Beinecke Collections may be found by searching the Finding Aid Database; recently acquired materials may be found in the Uncataloged Acquisitions Database. Please join us for a poetry reading by Yusef Komunyakaa on Thursday, September 20, 4 pm. This event is free and open to the public. The Beinecke Library is located at 121 Wall Street, New Haven. Pulitzer Prize winner Yusef Komunyakaa is the author of many collections of poetry, including Pleasure Dome: New & Collected Poems, 1975-1999, Talking Dirty to the Gods, Dien Cai Dau, and Neon Vernacular: New & Selected Poems 1977-1989. He has received awards from the Louisiana Arts Council, and the National Endowment for the Arts, and he was awarded the Bronze Star for his service in Vietnam, where he served as a correspondent and managing editor of the Southern Cross. For additional information about African American Studies at the Beinecke Library visit: http://beineckejwj.wordpress.com.